Art Larrance was no stranger to the Oregon craft beer scene when he established Cascade Brewing in 1998. He partnered with Brewmaster Ron Gansberg, who oversaw the design and installation of the Portland brewhouse. Together, they took their more than 40 years of combined brewing experience to create fantastic sour beers inspired by an abundance of Oregon fruit. Each of their beers is then aged on wine barrels from the Northwestern Oregon region. Cascade Brewing is a pioneer of the sour beer movement, with all the gold medals and world-class titles. In celebration of our all-day Tartuary Winter Sour Beer Festival, we offer a flight of Cascade sours that we call Craft Beer Crosscut 1.31.19: A Flight of Cascade Brewing. 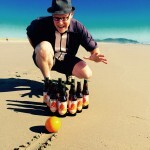 Fifteen years ago, Cascade Brewing and Barrel House began stuffing some fruit and bacteria into the wooden barrels left over from an oddball project in which they recreated the journey of transcontinental journey of traditional English IPAs. That experiment resulted in the birth of a kriek that was named the best in the world by the New York Times. Cascade was off and running as leader of the sour revolution. Its Midnight Bramble will delight sour beer fans with a blend of sour wheat and blonde ales that has been aged in oak wine barrels for up to 18 months with black and red raspberries, fresh ginger and thyme. This lengthy process results in a unique sour ale that offers carefully layered flavors of ripe bramble fruit with a refreshing ginger lift and soft notes of lavender and pine. 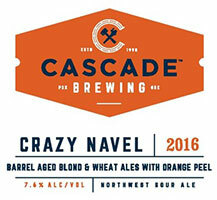 Crazy Navel 2016 is a blend of sour wheat and blonde ales aged in oak wine barrels for 14 months with fresh orange zest. Using both Cara Cara and Heirloom varietals, Crazy Navel captures the essence of the navel orange balanced with a refreshingly tart and dry base beer. Fruitopian Noyaux is a blend of sour triple and wheat ales aged for up to two years in oak wine and bourbon barrels with tangerine peel, blackcap raspberries and apricot noyaux. This limited draft project offers complex citrus and berry fruit notes with hints of bourbon and toasted almond, creating a utopia of flavors in every glass. Sang Noir is a blend of imperial red ales aged in bourbon and wine barrels for up to two years with Bing cherries. The darkest in Cascade’s series of “Sang” projects, Sang Noir features flavors of dark roast malts, bourbon, black cherries and port wine. Primordial Noir is a blend of imperial red ales aged in bourbon and wine barrels for up to two years with 150 pounds of Northwest-grown Bing cherries and spices. 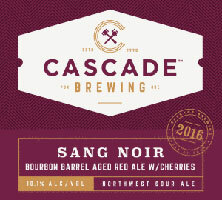 A concentrated precursor to Cascade’s Sang Noir project, Cascade Brewing chose to skip the red wine aged reds and go straight with the bourbon barrel reds and cherries. The reds shine spectacularly with a balanced cherry flavor. Primordial Noir also offers a robust bourbon flavor with notes of roast malt, molasses, and baking spices.